Over 700 different varieties of vegetable, flower and herb seeds, as featured in the Southern Exposure Seed Exchange garden seed catalogs. Enter the Discount coupon code - catcom2013 - at checkout on the Southern Exposure website. Vegetables - Skip a trip to the produce aisle and fill your own backyard with heirloom vegetable seeds that are ready for the planting and guaranteed to produce delicious homegrown vegetables that are ripe for the picking. You'll find heirloom seeds for all seasons, from succulent Summer to Winter squash, sweet Spring peas to Autumnal pumpkins and gourds. Specializing in Southern heirlooms, you'll have access to Tennessee peanuts, collard greens, okra, butterbeans, and even naturally colored cotton! Grow the juiciest of tomatoes and turnips, radishes and rutabaga, potatoes and perennial onions, broccoli, brussels sprouts, and beans of all flavors and varieties. Herbs - Grow your own herb garden with the Southern Exposure Seeds selection of herbs that have the power to heal, calm, relieve stress, and make a mighty delicious meal. You'll find popular medicinal herbs including chamomile, ginseng, Echinacea, St. John's wort and wormwood as well as tasty culinary herbs such as basil, garlic, chives, dill and parsley seeds that will liven up any recipe. Flowers - Inject some color into your garden and landscapes with heirlooms that are vibrant, fragrant, and ready to plant. Choose from fresh flowers such as zinnias, cosmos, marigolds and more, drying flowers, and cheer spreading sunflowers, with 20 varieties to choose from including heirlooms introduced before 1940. Shop online now, or request your own garden seed catalogs today! Books, DVDs & Supplies - Get started with helpful books and DVD's that will have you growing like a pro in no time. You'll find a handy collection of gardening how-to books and resources to choose from as well as a selection of gardening staples including pots, self- seal seed packets, wooden garden markers, and all-inclusive organic growing kits that come equipped with certified organic seeds and soil, 8 organic biodegradable pots, certified organic plant food, and easy, illustrated instructions. 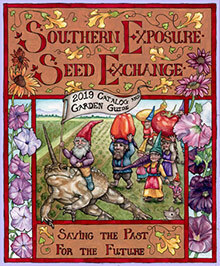 The Southern Exposure Seed Exchange catalog is your ultimate gardening source, offering over 700 varieties of vegetable, flower, herb, grain and cover crop seeds that will help you grow the ultimate garden.